My friend and I have an annual holiday cookie/candy making get together. Sometimes we make the same recipes and often times we try some new things. 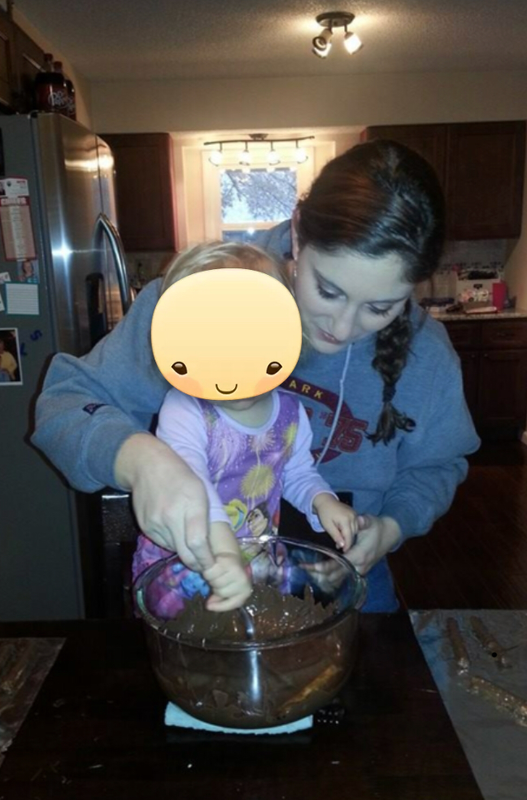 My friend has a 5 year old and we’ve been doing it for 4 years so we’ve always done kid friendly recipes like chocolate covered pretzels and peanut clusters. Chocolate covered pretzels – melt almond bark according to instructions on package. Dip pretzels and lay them out on wax paper. Sprinkle with Christmas sprinkles. Peanut clusters – melt chocolate flavored almond bark according to instructions on the package. Pour dry roasted peanuts into the almond bark. Use cookie dropper to drop onto wax paper. Sugar cookies – these are probably the best I’ve made. I was in a pinch for time and was looking for a recipe that didn’t require the dough to chill. Sugar cookie icing – I usually just make my own with a stick of butter, about 2 cups of powdered sugar, a 1/2 tsp of vanilla, and a splash of milk until the texture is right. Usually no more than a couple tablespoons of milk. Chocolate chip cookies – we use the standard toll house recipe at our house. Peanut butter fudge -this is a deliciously silky fudge and super easy. I’ve made it so many times and never had a failed batch. I’m looking forward to having 4 extra hands next December…. although wrangling two year old twins in the kitchen might be more fun than I can take on. Dad has a whole year to build my kitchen helper stands.